MOSCOW, January 13. /TASS/. /TASS/. 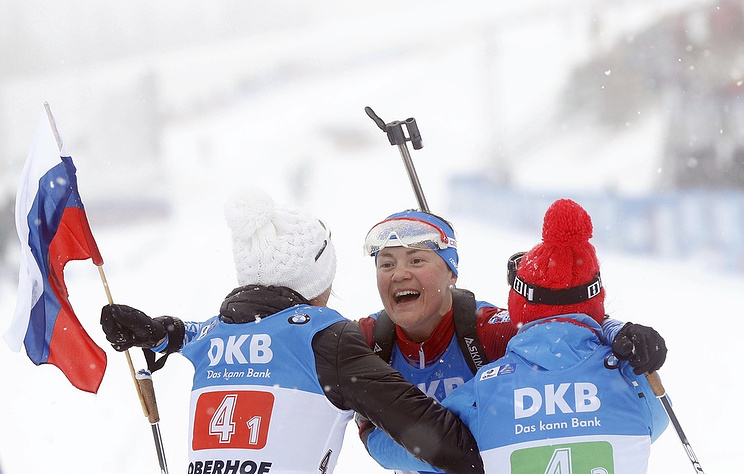 Russian biathletes Evgeniya Pavlova, Margarita Vasileva, Larisa Kuklina and Ekaterina Yurlova-Percht on Sunday grabbed gold in the women 4×6 km relay competition at the IBU World Cup in Germany’s Oberhof. The Russian team finished in one hour, 18 minutes and 46.3 seconds with eight extra shots, being 33.5 seconds ahead of the German team (2+10). The Czech team finished third (+36.7; 1+6). Vasileva fell down during the race, dropping down by five places. This is the first win of Russian women biathletes in an IBU World Cup relay event since 2012 when Anna Bogaliy-Titovets, Svetlana Slepovtsova, Olga Zaitseva and Olga Vilukhina took gold in this discipline, also in Oberhof. The Russian women biathlon team is the first in the relay standings, with 103 points. It is followed by Germany (90) and Sweden (90). Hey Buddy!, I found this information for you: "Russian women biathletes grab gold in relay event at IBU World Cup in Oberhof". Here is the website link: https://russophile.org/russian-women-biathletes-grab-gold-in-relay-event-at-ibu-world-cup-in-oberhof/. Thank you.